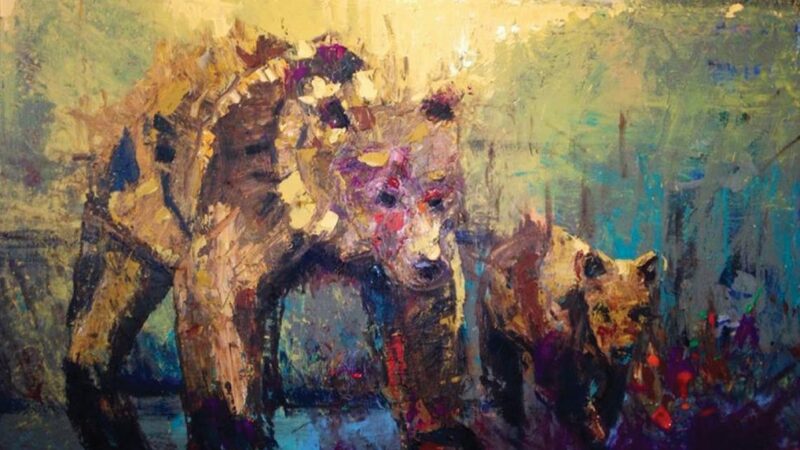 For Kira Fercho, the painting process doesn’t begin with a blank canvas but rather with an open mind. The process is interpersonal and cerebral before it is artistic and physical. Prior to the initial work of art creation, Kira develops a personal relationship with the future viewer who is often a homeowner, but may also be an interior designer, builder, architect, or, as in the case with her corporate clients, a board or foundation member. Once Kira has had some free-flowing conversations and viewed the space, she formulates a vision of a painting in that context, an artwork that will spark the personal passions of the viewer. She then identifies the problem to be solved—a space in a home with a void; a client with a particular color affinity or idea needing to be expressed; or a communal environment that needs its occupants to be represented and spoken to through art. Before picking up a brush, Kira has formulated a structure, mixed a color scheme, and visualized the end experience. In Riders Kira creates a scene where the sky dominates and the riders merely skim the surface. 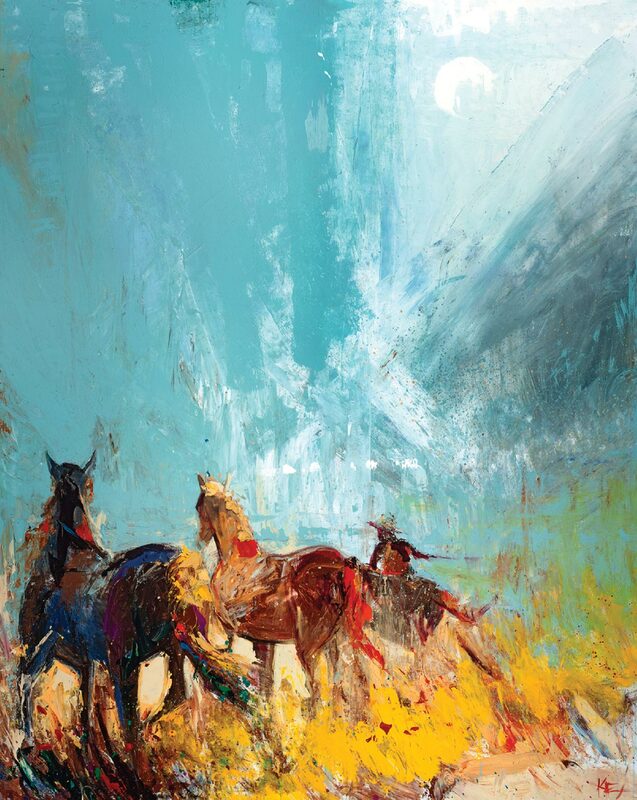 She uses an Impressionist style to create a sense of movement as the horses and riders trot across the prairie. In this 5’ by 4’ painting, the sky stretches from the viewer’s feet, over the head, and up into the sun. The result is an experience of 180 degrees of sky… a feeling intimately known by this “Big Sky” artist. Before beginning any of the twelve paintings, Kira did extensive research. Each lodge had to be researched individually as every tribe has different traditions, histories, geographic locations, cosmic views, and symbol systems. Kira read books, drove all over the state, and visited tribal members who gave her insight. She strived to capture the landscapes, traditions, and symbols that represent each tribe as a whole. The final work could never be “perfect” but at a certain point Kira just had to make decisions and move forward. When she turned over her notes to the Billings Clinic she said, “Please understand that this is a project that could have taken my entire life.” Fortunately for us and the patients, family members, and professionals at the Billings Clinic, it didn’t. 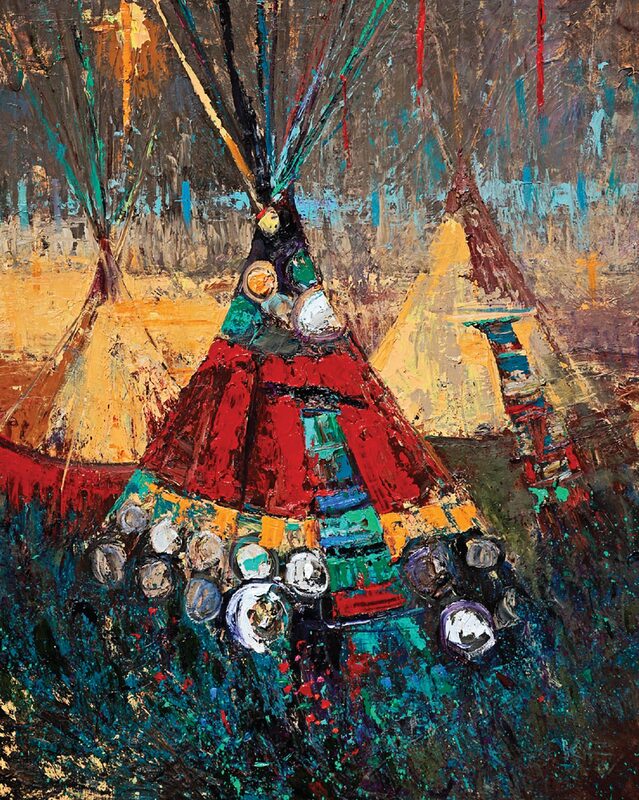 Inspired by contemporary Blackfeet design, the center tipi dominates the painting. From the grasses on the ground to top of the tipi poles in the sky, the angles are vertical and straight. Contrasting with the linear elements are large white circles at the base of the lodge. “The circles represent the children of the tribe. Every tribal member’s job is to protect the young ones and raise them. The lodge, like each member of the tribe, protects the most vulnerable,” Kira explains. For more details or to receive the e-newsletter, visit www.kirafercho.com, call 406.661.1030, or email kira.fercho.art [@] gmail.com.